One of the best comedy tv series of all time. Seinfeld is only second to Married With Children, thats my opinion only, and to this day I still watch reruns on tv to the point Ive memorized them practically. Brilliant work, really there was no hard decision here, I knew I was going to buy this years ago, I just needed the spare money to do so. I bought the special "Fridge Set" which is basically a cardboard fridge around the normal coffee table set, I thought It would be metal like a oldschool lunchbox since some have magnets but its just cardboard. Ive bought Little House On The Prairie the box set, and Recently X Files the complete boxset. Seinfeld is by far the best to protect the great video on the DVDs. All the dvds have a plastic tray each, which makes it easy to inspect the backside of the discs for broken ones. This is how all dvd complete sets should be done. I love this, there are 2 albums and you just flip to the dvd you wish. Excellent job, hats off to the manufactures, I wish they did this with Little House On The Prairie and X Files which both have paper/cardboard sleeves only. This takes a bit more space, the fridge set is almost double the size of the X Files set, But Ill take size to keep the dvds in proper working condition. Im sure you don't even need any reviews of this set, Seinfeld speaks for itself and sells itself, but how its packed is important to some of us, so I hope my review helped you there. For starters, I already own the first 3 boxsets that had seasons 1-5. But as much as I love Seinfeld, I had to have the complete BOX; an even more so- the Refrigerator BOX! When it arrived, I was entranced. The packaging is perfectly kitchy, in the Seinfeld style. Very smart, and it feels appropriately representative for what it contains. So much of the show revolved around Jerry's apartment and it seems like the greatest amount of action happened at Jerry's fridge! The first thing I took out and immediately watched was the roundtable discussion disk that features Larry David. He has become as memorable a character as himself (thru his writing, voiceovers and own show) as the rest of the cast. They all shared a great time with us, and Jerry and Larry are always ON. Since then, I haven't viewed anything. I still watch the syndicated run at 11PM every night... with commercials! But I feel that the investment was worth it; Seinfeld is the best TV show of all time. average fans will be content with the regular season box sets, but die hard enthusiasts like me will want this impressive complete series collection. is it really that much better? maybe not, but the presentation case and book seem to give it a bit more class. but serious seinfeld fans probably already have the first eight seasons....so what are we to do?! thank god for eBay! 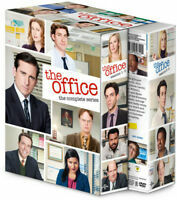 i plan on selling my first 8 seasons and upgrading to the complete series set. i'm sure i'll have to pay out a little bit of my own cash too, but it's not that big of a deal. the complete series of seinfeld is finally available on dvd, and i'm on cloud 9! The product was in slightly used condition but very well kept. I love the set. The book is amazing. The dvds come off the seam pretty easily it needed to be thought out better. But overall this is an amazing deal and if you LOVE seinfeld. You will LOVE this.